Today (March 24) marks 30 years since Pet Shop Boys released their debut album Please. Emblematic of much of 1980s synth-pop at the time (cascading synths, electronic melodies, arpeggios, pulsating drum rhythms), the record brought the London duo stateside prominence, thanks to a #1 chart placing for their debut single. But despite its success, there’s one core element of the record that seems to be swept under the rug; the album remains a cultural touchstone in popular music, not only for its sonic influence, but for what Please (and the duo of Neil Tennant and Chris Lowe themselves) represents in terms of sexuality and LGBT representation in pop music. To put it into perspective, Please was released during a pivotal period of the gay rights movement. America was five years into the AIDS crisis. Mass media (despite its stance of objectivity) was largely marketed through a heteronormative lens and the AIDS virus was dubbed “the gay cancer” by numerous media outlets. The disease savagely ravaged a great deal of gay and bisexual men, but that was just one part of a larger issue at hand. In the grand scheme of things, no one seemed to mention the thousands of lives lost though intravenous drug use, the thousands of heterosexuals affected by the disease or the historically apathetic response by the Reagan administration. The decision to position the AIDS virus as a “gay issue” or “bisexual issue” only pinpoints to the homophobic and biphobic agenda that loomed in American households at the time. Thank God for MTV. If you were born before or slightly after the Studio 54 era, you realized that Music Television was in full swing. While a nascent music channel might sound innocuous in curbing sexual prejudice, few could have foreseen how it would became a bastion for racial equality (Michael Jackson), sexuality (Madonna) and feminism (Janet Jackson). However, there were still barriers that needed to be broken. Artists sung of relationships with either men or women, but rarely the former, and certainly never both of them, in part due to conservative views on homosexuality and bisexuality (not to mention that erroneous misconception that there’s no such thing). A slice of synth-pop bliss with an overt hip hop bent, the single became Tennant and Lowe’s breakout hit, ascending to the top of the Billboard Hot 100 in the spring of 1986. In spite of its title, it’s the song’s infamous lyric, “Which do you choose, a hard or soft option?” that serves as the duo’s calling card: Sexually ambiguous lyrics that apply to both gay and straight relationships. While the lyric may be cryptic at first, we knew precisely what these two Londoners were getting at. By alluding to both male and female sexual partners, the pair showcased that a preference for both did not have to be taboo. This was the ’80s after all, a decade where tropes, conventions and stereotypes were systemic. If you were a high school kid at the time, chances are you were classified as the either “a brain,” “an athlete,” “a basket case,” “a princess” or “a criminal.” The same could be said for sexual orientation. Societal norms used reductive labels such as “gay” or “straight” to classify and compartmentalize the LGBT community. Continuing their reflection of LGBT culture onto mainstream pop culture, Please album track “I Want A Lover” effectively fuses bare bones synthesizers with lyrics that reference the narrator’s latest go-around on the club circuit. “I don’t want another drink or fight, I want a lover tonight“, delivered in singer Neil Tennant’s signature tenor, seems to hint at disillusionment with gay nightlife, while also clearly acknowledging its lustier side. As we now know, toying with the listener’s mind with themes of sexual ambiguity became a recurring element in Pet Shop Boys’ artistry. It’s no surprise that speculation about Neil Tennant’s own sexuality arose when he and Lowe became a global pop sensation, as further hits like “Opportunities,” “It’s A Sin,” “What Have I Done To Deserve This,” “Always On My Mind” and “Domino Dancing” came down the duo’s pipeline. 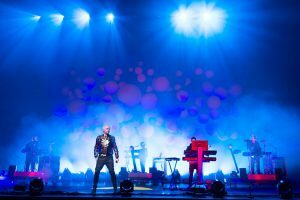 Any naysayer who disagrees with the notion that Pet Shop Boys have contributed to LGBT culture at large should consider this: The next time you hear a sexually ambiguous lyric on the radio (Blur’s “Girls & Boys,” The Killers’ “Somebody Told Me,” Katy Perry’s “I Kissed A Girl,” A Great Big World’s “Hold Each Other”) or a song that applies to both gay and straight relationships (Madonna’s “Erotica,” Lady Gaga’s “Poker Face,” Sam Smith’s “Stay With Me,” Years & Years’ “Desire”) remember that Tennant and Lowe were one of the first major label pop acts to bring the gay conversation to the top of the charts on both sides of the Atlantic. And they did it well. We salute Pet Shop Boys on the 30th anniversary of their debut album Please. You can pick up Neil and Chris’ upcoming album Super — their 13th studio release — on April 1.